Welcome to Flamar Engineering, LLC. 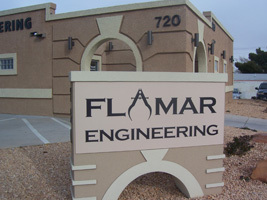 On March 19 2004 Flamar Engineering LLC, a structural engineering firm, was established in Las Vegas, Nevada. We have highly intellectual and respected engineers that specialize in structural engineering for commercial, industrial, institutions, residential owners, architects, and contractors. We also provide drafting services. The objective of our business is to provide a quality, professional, and reliable service for our customers. We Have Moved!! Our new address is 720 South Jones Blvd. Las Vegas, NV 89107. Request Info or ServicesTo inquire about or obtain any of our services please fill out our short questionnaire by clicking below. Service Request Form Now Hiring!Interested in working with Flamar Engineering? We are currently hiring Senior and Junior Engineers and Drafters. Click below to get a full list of position requirements and download an application.